This article includes answers to some common questions about the Social Media Command Centre Dashboard. Why doesn’t this dashboard show me any trends or performance metrics? This dashboard focuses on current data and is ideal for offering visibility into how your company is performing today in social media channels. Why isn’t historical data available for Twitter, Instagram, and Pinterest? Some services, like Twitter and Instagram, do not make historical data available to customers via their API. I don’t use all these social media channels, can I remove them from this dashboard? 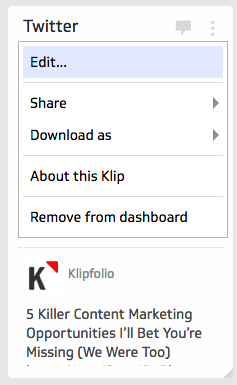 Simply click the menu icon at the right-hand corner of the Klip and select Remove from dashboard. You can then update the layout of the Klip by dragging the remaining Klips to adjust their size or modifying the layout grid (via the Layout button on your dashboard). I’m getting an error when connecting to my YouTube data. What’s going on? This is usually a simple fix. How do I get this up on a wallboard? There are manyoptions for getting your dashboards up on TV screens around the office. Here are some solutions our customers have used. How do I change the height of the bottom row of Klips? 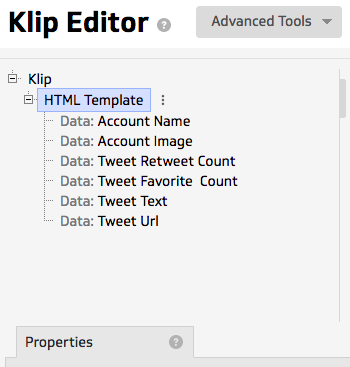 You can change the height of the bottom row of Klips by following a few simple steps. Click HTML Template in the left-hand component tree. 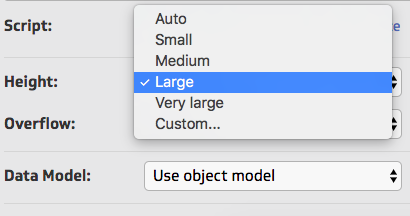 In the Properties panel, select the desired height. Why is the number of followers that I see on the LinkedIn Klip slightly different from the number that I see in my LinkedIn account? The trends in LinkedIn analytics have a slightly different number than Klipfolio. This is because we are taking total followers until today, and LinkedIn is showing total organic followers until yesterday.